Welcome to MD Legal, a legal blog by Webb & Wolf. This blog will offer some practical advice to serve as background general knowledge based on Maryland law. This Website is NOT intended to be legal advice. You should NOT rely on this website or any posts as legal advice. Every case is different and you should talk to an attorney about your own case to get competent advice. 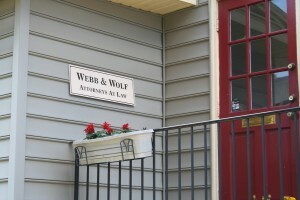 Using this website or contacting Webb & Wolf does not create an attorney/client relationship. An attorney/client relationship is created upon a mutual understanding of both the lawyer and the client, and usually involves a signed retainer agreement. We hope you find this blog useful. If you have any questions or have legal matters that you would like to discuss with an attorney at Webb & Wolf, you can call (410) 321 – 1896.